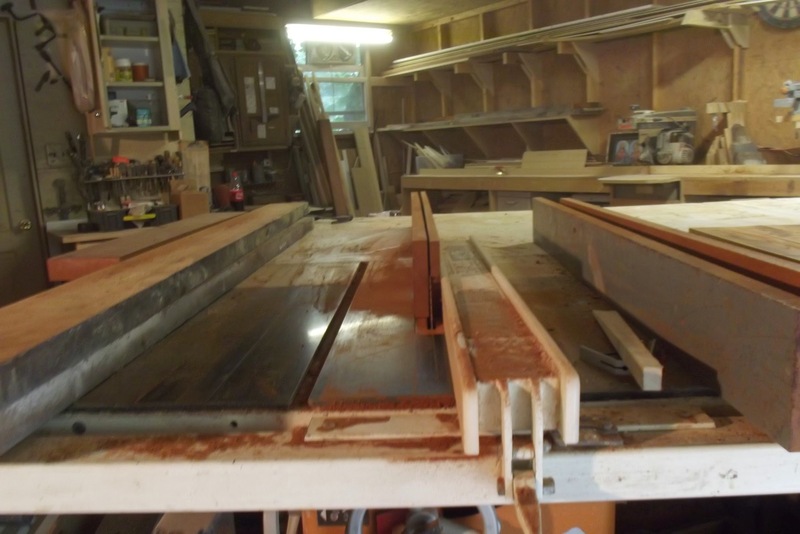 It slices through this 2″ thick mahogany without any trouble as we rough out the door frame stock. The first glimpse into the heart of this beautiful piece of wood. 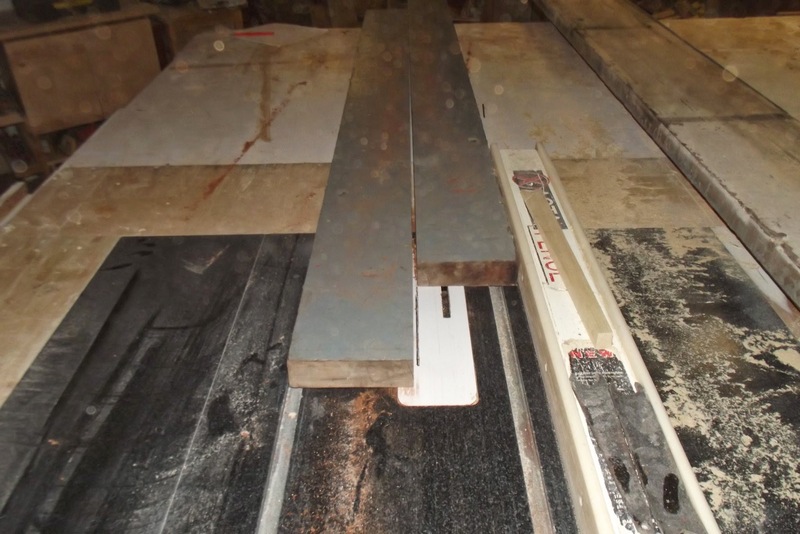 Below, We have resawn the stock into 5/8/” thick 5″ wide planks, being sure to leave them much longer and wider than is needed so that they can be cut down to the final dimensions. 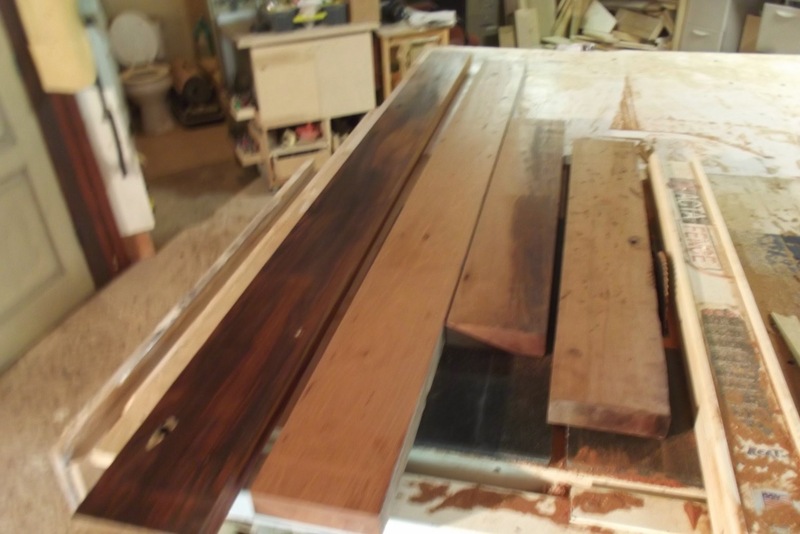 Here are those resawn planks laid out to insure the fact that we have plenty to work with later. 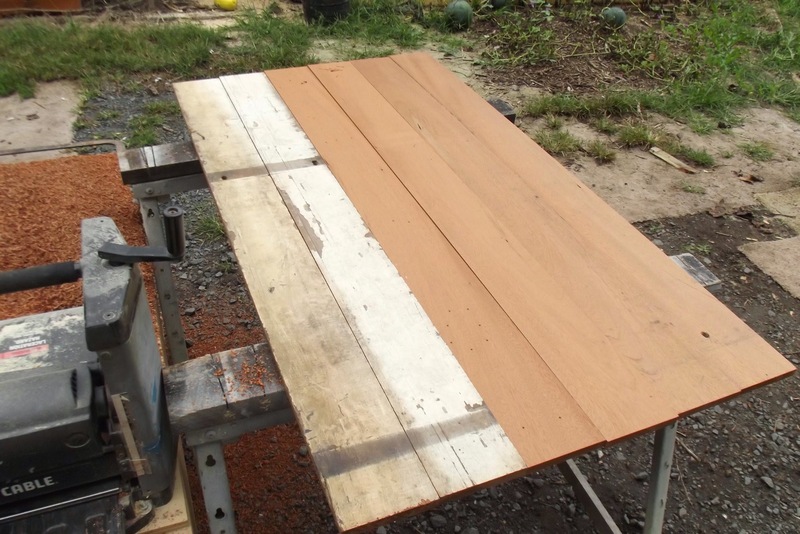 A few passes across the portable Porter Cable 12″ planer and they clean up nicely. 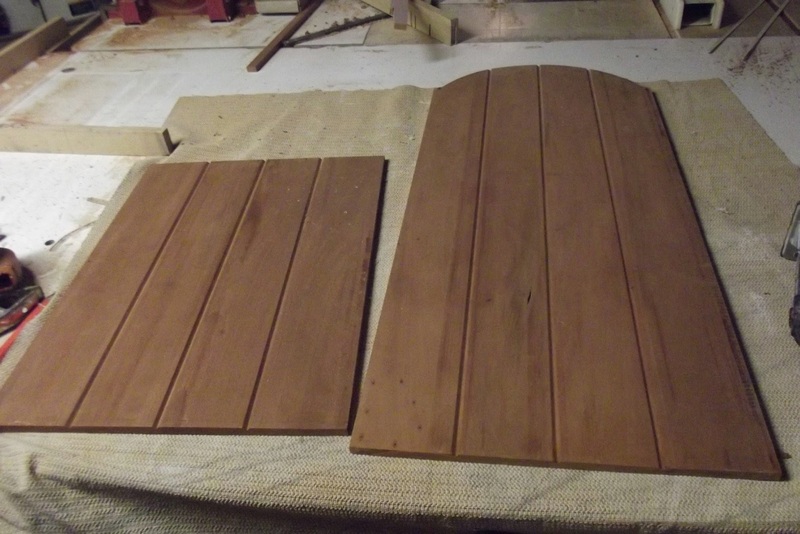 These four pieces are soon to become the frame components for our Tiny House door. I am using a MLCS door making router bit set with a Ridgid fixed base router mounted to a shop built router stand to shape the rails and stiles. 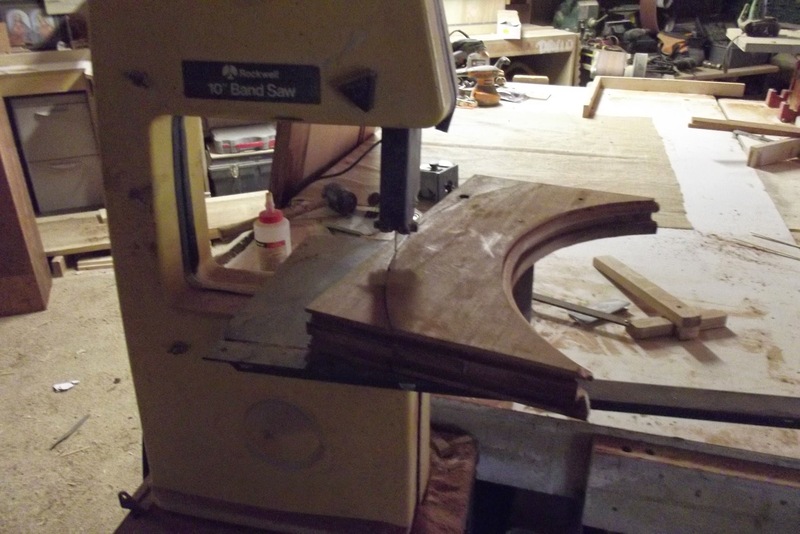 I removed the top cove bit and replaced it with a rub collar so i could free hand rout the arched top piece allowing it to follow the curve of the workpiece. 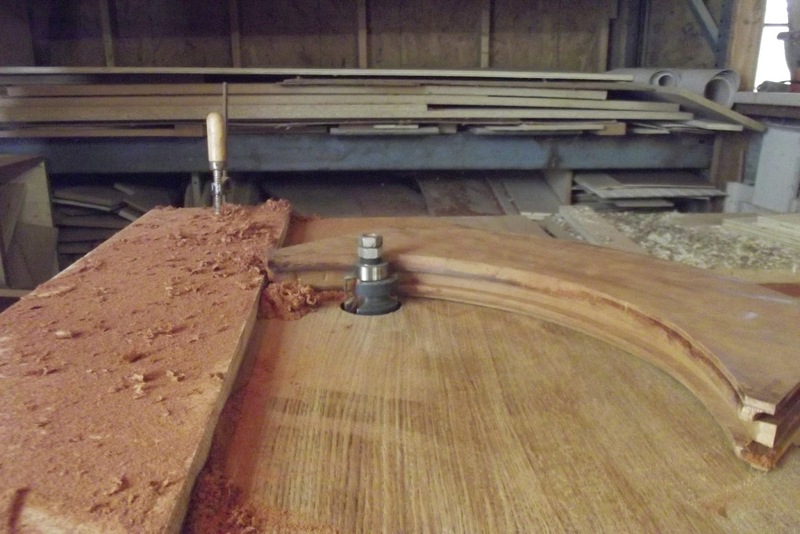 I roughed out the curve I wanted to follow on the top of the door on this ancient bandsaw. It has been in use in my shop for over thirteen years now, and it has never once let me down. The blades are harder and harder to find for this thing. They are not a common size, 72 1/8″ if anyone would like to contribute. 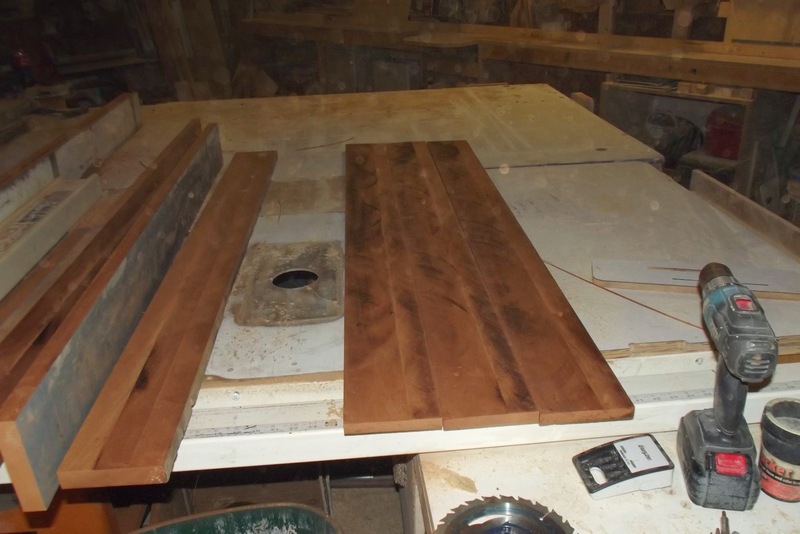 The panels after being glued up and left in the clamps for a few days. 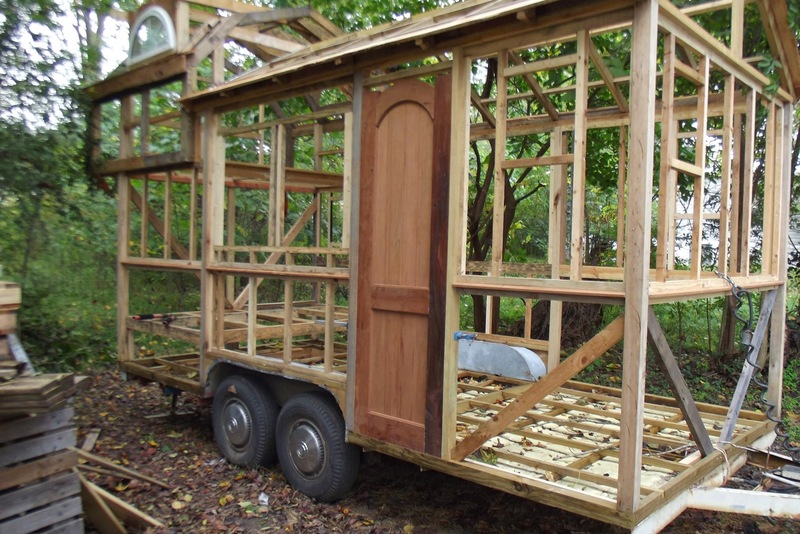 We used Gorilla glue, it is a great adhesive for this type of project when used properly. It needs a mist of water to fully activate the adhesive, I notice some folks paying no attention to the labels and instructions on products and missing out on their full benefits. So help yourself out and read labels and data sheets. 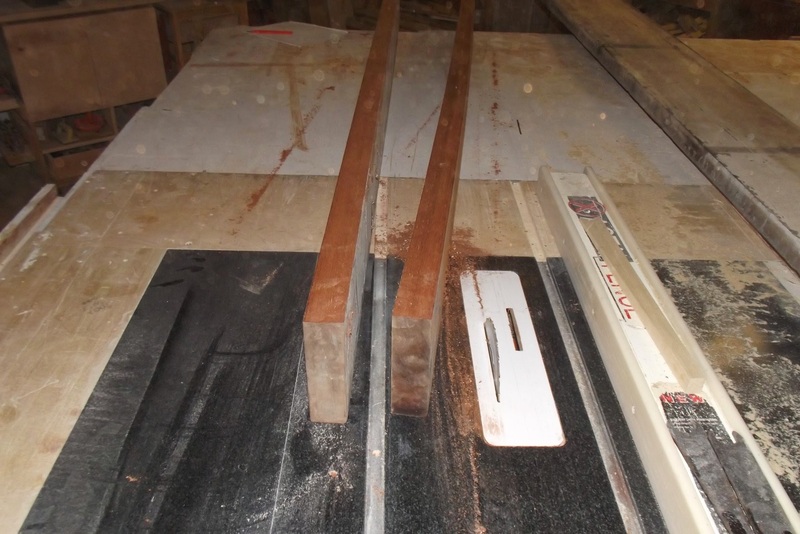 I placed a veining/ V groove bit into the router table and routed a groove in the center, then i measure to the center and subtract 3/8″ which slips into the frame,from that measurement I mark and rout a groove that results in equally spaced grooves once it is installed in the frame. Mimicking the plank style construction that Mandy wanted. 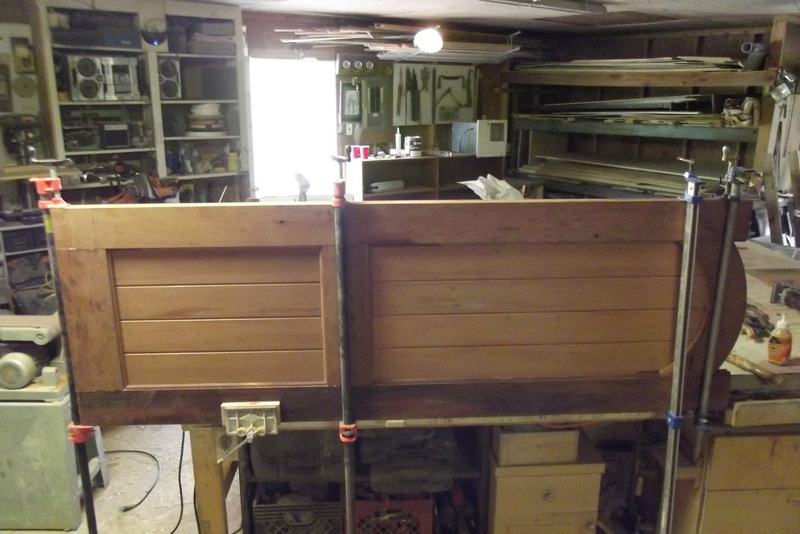 I dry fitted the parts and assembled the bottom portion rails to the stile from one side, glued and clamped them square and flat, then sit the assembly aside to dry. 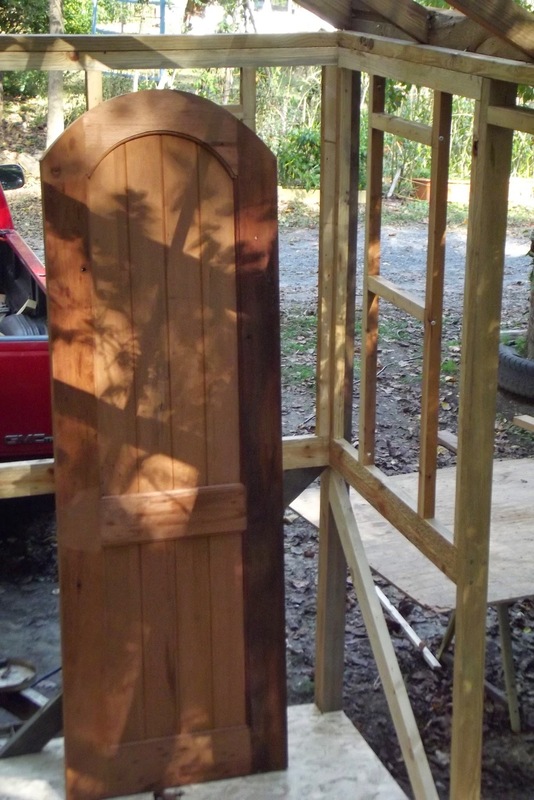 Once it had sit and the glue dried I assembled the remaining parts and clamped the door square and flat and sat it aside once more. Here I clamped an aluminum yard stick between the jaws of a pipe clamp to continue the curve onto the stiles. I clamped it in place with a few spring clamps and trace the shape. 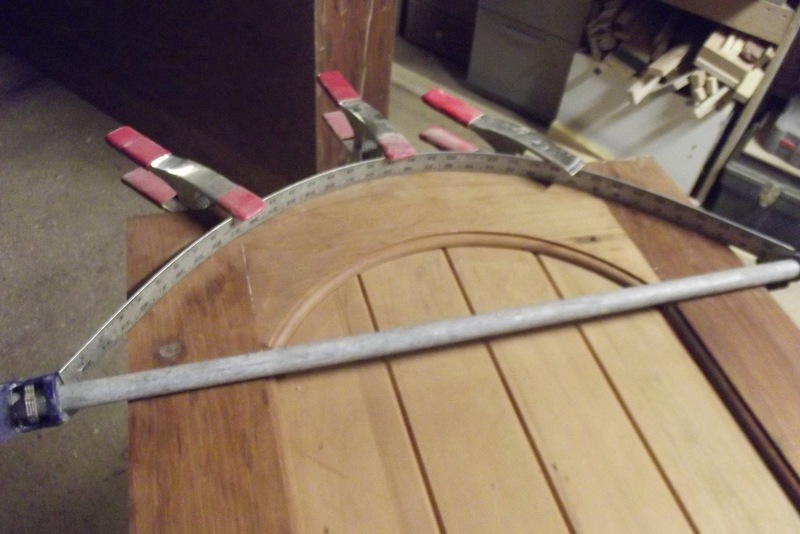 Then using a saber saw i cut the arch to just outside of my layout lines. I sanded the radius smooth with a hand held belt sander. 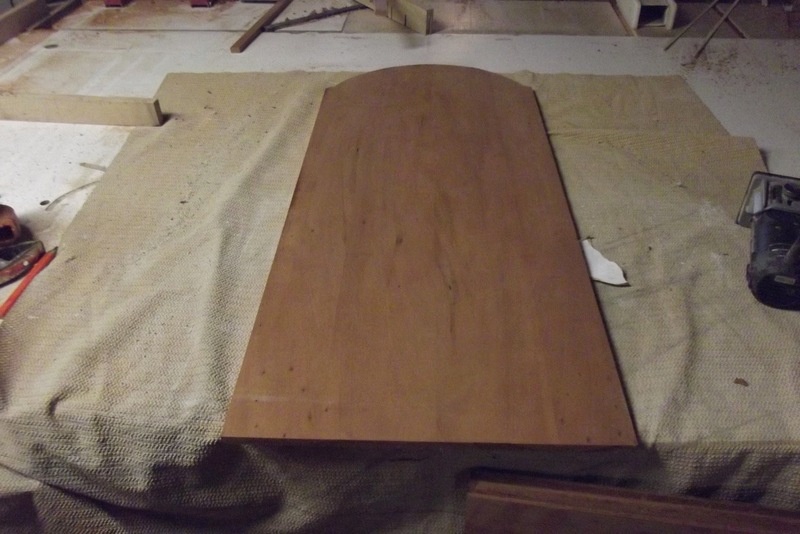 The finished door assembly ready to hinge and hang. It will be separated in the middle of the center rail by cutting it on a slight bevel. 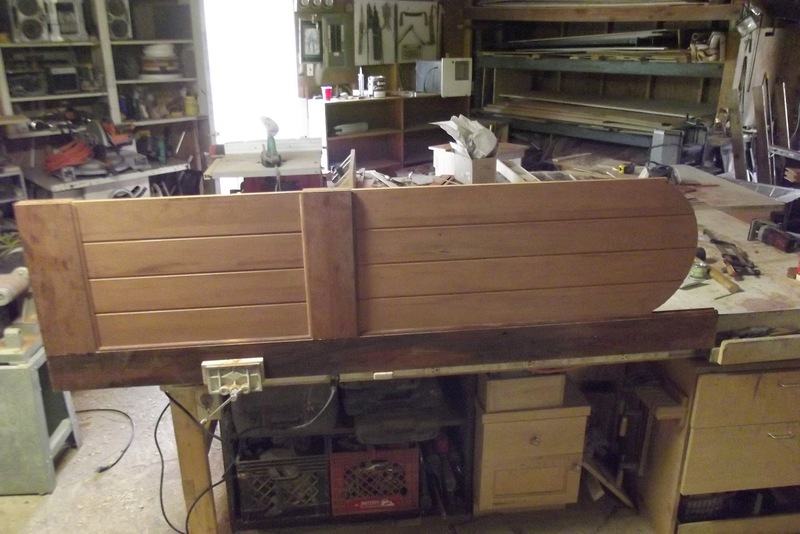 Making a dutch style door. A quick dry fit in the opening and we get an idea of the finished product in position. We were fortunate enough to find a pair of unused black gate hinges that we feel will tie in nicely at a rummage sale in a nearby neighborhood for the bargain price of two dollars.